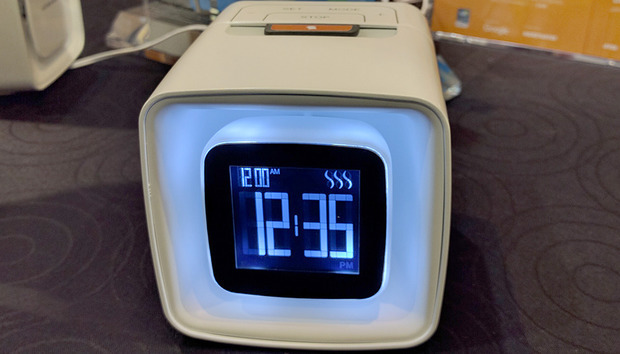 It’s called Sensorwake, it promises to wake you up from sleep with pleasant smells instead of harsh sounds, and it may be one of the most untenable gadgets you’ll find at CES 2016. That’s right: untenable. I have two main objections to the Sensorwake “olfactory alarm clock”: (1) Studies show that our sense of smell shuts down when we’re sleeping, and (2) the clock doesn’t have a bacon scent option! Seriously, there’s no bacon option. That’s almost indefensible given everything we know about about the olfactory benefits of cured pork products. SensorWake’s scent capsules use dry-air diffusion to create intense aromas. I asked Guillaume Rolland, Sensorwake’s inventor, to address my concerns. On the first point he told me that the clock’s unique dry air diffusion technology can produce extremely intense, concentrated smells that cut through the fog of slumber. He says SensorWake has been tested to be effective with users of all ages, and only stuffy noses present real problems. As for the second point? Rolland says a bacon option was available to early Kickstarter backers, and may make a comeback when the clock sells to a wider retail audience. Being fully awake during the Sensorwake demo, I couldn’t verify Rolland’s assertion that the olfactory alarm clock does, in fact, work as an alarm clock. But I can tell you that the Espresso and Chocolate scent cartridges smell pleasant, while the Croissant scent is best described as toast-like, or croissant-adjacent, but not anything that really smells like a real croissant. At any rate, the clock promises to gently rouse you from slumber within two minutes of its scent alarm going off. The scent capsules can be recycled, and current offerings include Chocolate, Peppermint, Espresso, Croissant, Seaside (monoi and tiare flower scents), and Lush Jungle (cut grass and leaves). Each of these scent capsules is good for 30 awakenings. And if your nose is stopped up, or you’re suffering allergies, or if, you know, you find that SensorWake just doesn’t work, be rest assured there is a fail-safe: An emergency sound alarm will go off after three minutes of uninterrupted scent diffusion. The clock itself costs $109. Scent capsules are sold in packs of two for $10. Sensorwake says the clock will be available in June to early backers, and will go full retail in November.